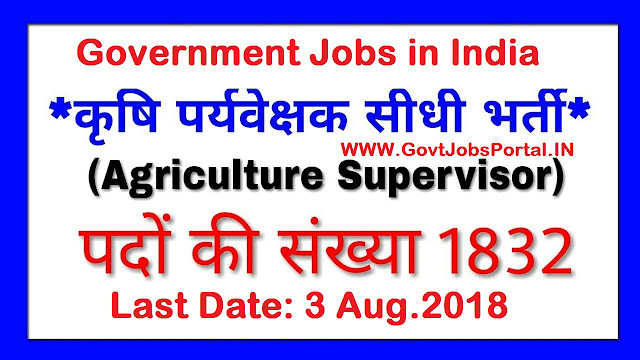 Government jobs in India for 1800+ Agricultural Supervisors posts through RSMSSB Recruitment process 2018. All Indian graduates are invited for these Government jobs in India. Online applications are invited from RSMSSB Recruitment department to fill up these vacancies in a single recruitment process. Rajasthan Subordinate & Ministerial Services Selection Board looking to heir energetic and well educated Indian candidates for these posts. More information about these Government jobs for Agricultural Supervisors Posts is given below in this post. Read it carefully before applying online for these Government jobs in India. This table contains the basic information about this recruitment process, which means the number of vacancies, job profile and pay band which candidates will get after selection. What is the Eligibility Criteria Required? The Age of the candidates must be in between 18 to 40 years. Candidates can pay the application fee through the following way: “credit card/ debit card/ net banking/ E Mitra Kiosk”. How to Apply these Government jobs in India? Those who are eligible and now interested in applying these Government jobs in India can apply online through the official website only. We share the link below for online application form. Just follow that link for more detail. Recruitment department decided to conduct a Written Exam for the selection of the candidates. Those who cleared the written examination will be placed for the respective job profile. 03/08/2018 Last Date for apply online.